My Saviour products for Winter lips! 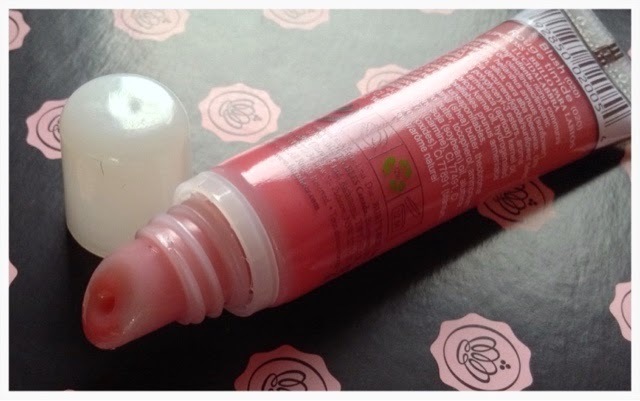 This is just a brief post to show you a couple of products that are saving my poor lips from the harsh Winter weather. The first is a Burt's Bees lip shine which I got in the November Glossybox, actually thinking about it both of these came from Glossybox, not the same box though I don't think. As I'm more of a lipstick person lip salves aren't usually my thing but this is lovely. This one has got a slight colour to it so it gives a lovely sheen. I also liked that it didn't come off straight away after drinking a cup of tea! I've been using it predominantly when I've been outside, school run, dog walking etc, as these are the times when I really feel the effects of the cold weather though central heating doesn't help either but I'm not switching that off! The nice thing about Burt and his Bees is that it's all natural ingredients and enriched with Apricot Wax which serves as a super moisturiser and also provides the sheer shine that you get with it. I've also tried this over lipstick and it looks great as a gloss too. 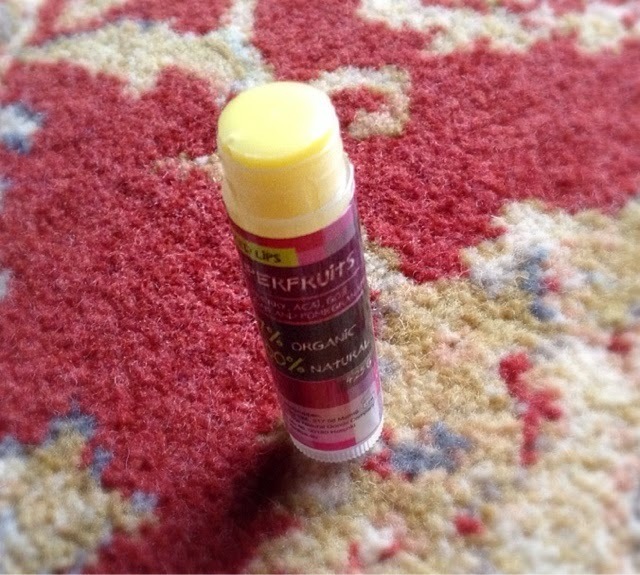 This product costs £6.99 (full size, as is the one in the photo) and if you want to check it out online the website is www.burtsbees.co.uk. 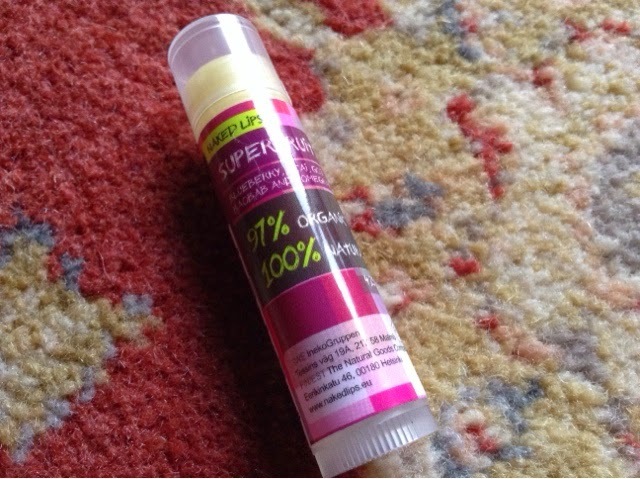 The next one is by Naked Lips, its the Organic Lip Balm Superfruits. I've been using this one at night because it's a balm not a gloss and therefore its got all night to sink in and isn't sticky and doesn't smudge everywhere! It does give a lovely shine but not in a sticky way so you could use it during the day as well of course. Naked Lips boast all natural ingredients in this product, mainly from superfruits so you get all the benefit of the antioxidants that they've got in them. This little beauty is 5 euros and can be purchased from www.nakedlips.eu. 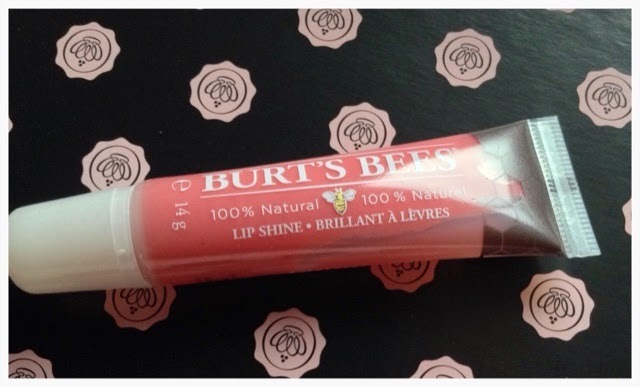 Out of the two of them I'd probably buy the Burts Bees again rather than the Superfruits but that's because it's got a sheen to it so it's more like a gloss which I prefer and also it got a bit of colour to it. But they're both gorgeous and perfect for this time of year. I've got a couple more to test, one is a lip scrub from the Federico Mahora range which I sell but I will do a separate post on that. What are your lip salve faves? 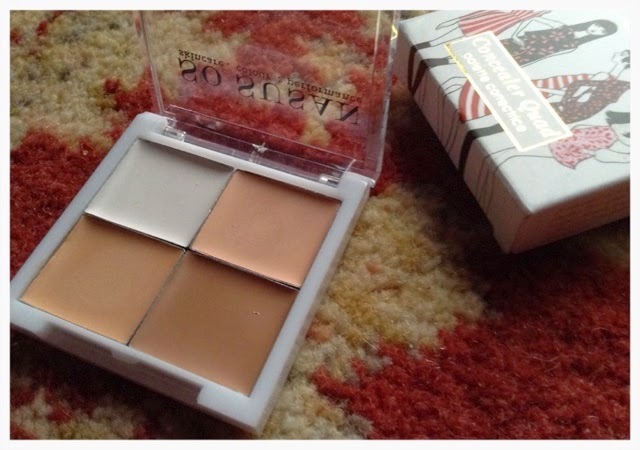 I received this So Susan concealer palette in a Glossybox last year, I think it was way back in the summer. I hadn't really heard of So Susan before I subscribed to Glossybox but since then I've tried quite a few of their products as Glossybox really seem to like them! I've had Glossybox for six months now and I haven't reviewed many of their products, life just seemed to get in the way so I've got a huge backlog of stuff to trawl though. I'm actually quite looking forward to doing that to be honest, I love discovering new stuff. Anyway, this is quite a nifty little concealer palette, it's a quad of colours that will suit the majority of skin tones I should think as the concealers go from very pale to quite dark, it is also good because in the Winter I am paler so my summer concealer doesn't always suit. Its also good for me because the colour on my cheeks needs a slightly different colour to that of my nose so this is great because it means that I don't have to fork out for several different concealers. It is compact enough to go into my handbag during the day for top up situations too and is non-comedogenic and full of lovely, nourishing ingredients so it doesn't irritate the skin. To be honest, I've been using the same concealer for a long time so I was a bit dubious about trying something different, after all, concealer is a base and if you don't get the base right then it has an effect on your entire face doesn't it? I was worried that it wouldn't "stick" i.e. it would slide off and my blemishes would be revealed rather than concealed, not a good look! But I needn't have worried, as well as only needing a teeny bit of this (it'll last a while) to cover up, it also stayed put pretty much all day, well as long as my other one does and that's all I was asking for anyway. 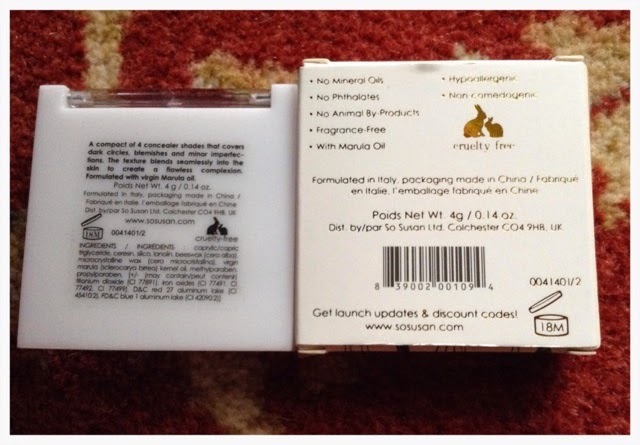 I'm not usually particularly struck by the packaging of beauty products. I know some people are but I'm generally more bothered about the actual product rather than the presentation but I have to say that I think So Susan have got this right, its just really classy, I really like it. 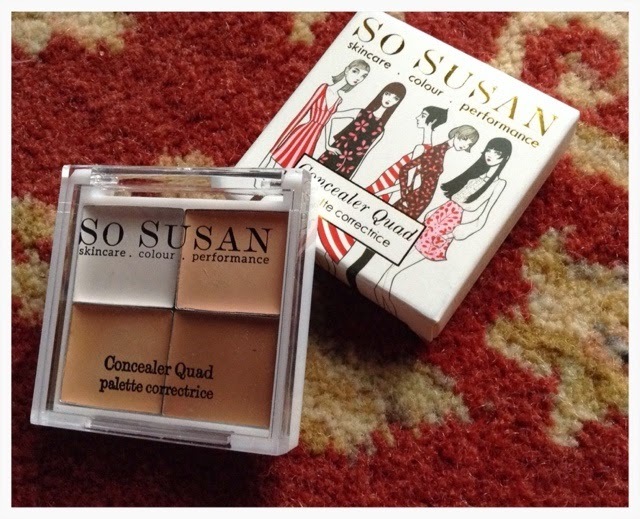 This So Susan concealer palette costs £18.95 from www.sosusan.com the website is great some of the products cost more than others but it is worth a look. I did quite well to get this through Glossybox as it is a full sized item. Hey there beauty bloggers, how's January treating you? We've managed to get to the middle of the month so not long to go until February and Valentine's Day and Pancakes (yum). Recently, I've been thinking about my beauty habits, my regime, what products I use and why I use them and I've realise there's some things I always do and don't really veer from, does this happen to you as well? I thought you might like to see my little list so here it is! 1. When I find a lipstick I really like and know I'll want to replace I always go out and buy another one immediately, I got so tired of running out of my favourite lipstick and then finding it had been discontinued, this happened to me a lot a few years ago and it was so disappointing! So now, when I find one I really like and know it's going to be around for a while I replace it straight away. Saves the disappointment later on! 2. As my hair is quite curly I don't brush it and I use a wide tooth comb on it when it's wet to comb it through. A hairdresser recommended this to me years ago and I've stuck with it ever since. It stops frizz and helps with the whole split end thing. They are really inexpensive from Superdrug and Boots. 3. I absolutely love Sudocreme, not only is it good for nappy rash and other child related ailments, its brilliant for spots, eczema, dry skin, cracked heels (yuck) and I also use it for blisters in the summer when my shoes have rubbed and I'm in full limp mode! It doesn't cost very much and a large tub lasts for ages and ages, I always get the large tub as I have three accident prone little boys who are always falling off their scooters and bikes so it gets used a lot! 4. This is a weird one, I've realised I always wear a hairband on my wrist for my ponytail emergencies. I've got a lot of hair and when gets in the way, I like to know I can tie it back immediately when I need to. The only problem is that I have to be careful as its not good to have a band too tight round your wrist, it does bad things for circulation. 5. I've only started doing this in the past year and I think I blogged about it at the time, but I always use an in shower moisturiser now, they're really good and save time in the mornings. In the summer I use a spray on one as well. The best in shower one I've tried and loved is Nivea and I particularly like the Vaseline spray ones, they do three different ones, the cocoa butter one is gorgeous. 6. I always use a rosewater based toner as the astringent ones are too harsh for my skin. Not only does it smell nice it makes my skin feel really soft and smooth and is fabulous for getting off the last of the make up, including that stubborn bit of eyeliner that gets stuck in the corners of your eyes. 7. Another hair based one, Argan Oil. A while back my hairdresser used some on my hair and its never been so smooth. I'm a bit of a self confessed Argan Oil addict actually not just for hair but body washes and hand creams too. But the Argan Oil for hair is magnificent, it also lasts for ages because its not one of those products that gets used every day and as its mainly for the ends of your hair not the roots you don't have to use much. The one I use is Morrocan Argan Oil which I think I got from Waitrose but I know you can get it in Boots too. It's about £6.00 but like I say, it does last quite a while so it's worth it. I have been using it quite a lot recently as this weather is no fun for hair. Hello 2015! Its New Year Resolution time again! Yikes, it's that time of year again, New Years Resolutions. I should probably start with a review of last years just to see if I kept them. Oh well ok, I didn't keep them for long, but never mind, let's just start again ... New year and all that. I say this most years but this year I am definitely going to do it because I am sure that I don't drink in enough and it's partly the cause of my headaches which are becoming more frequent and I know that I am dehydrated. Plus, water is so good for your skin, especially in the Winter because the cold weather and the central heating really dries it out. I'm rubbish at this usually, but I've bought some special cleaning stuff to clean my make up brushes, one is a spray which you can use if you want to just give it a quick spray and another is a special shampoo for a deeper clean when you have more time. I haven't done it yet but when I do I'll let you know how it goes! Now, I feel a bit of a hypocrite about this because I am always nagging my kids to hang things up (well, the older one anyway the little ones can't reach) and I have to say that I do hang their stuff up really nicely. Perhaps that is the reason then, that when it comes to my own clothes, when I take them off I pile them somewhere before I fall into bed rather than hang them up. A consequence of this rather annoying habit is that I eventually end up with a (really neat) pile of clothes that I have to spend ages putting away because a) I can't find anything and b) the pile is falling over and making a mess. Its totally ridiculous. So this year I'm going to just do it, it only takes seconds and will save a lot of time in the long run. I'm not making any resolutions about fitness or exercise (though I need to lose half a stone as I've put a bit of weight on and half my wardrobe doesn't fit now which is really annoying) because who needs that pressure? I'm the sort of person who doesn't respond well to "diet" pressure its better if I just eat sensibly and don't think too much about it. But I have invested in a new Davina McCall DVD which I am very excited about and can't wait to get started once the kids are back at school next week. I can't leap around in the front room with them around as I get interrupted and that's just annoying! So a very happy 2015 to you all, I'd love to hear what your resolutions are too.